Apple will roll out major updates to all its major software platforms. 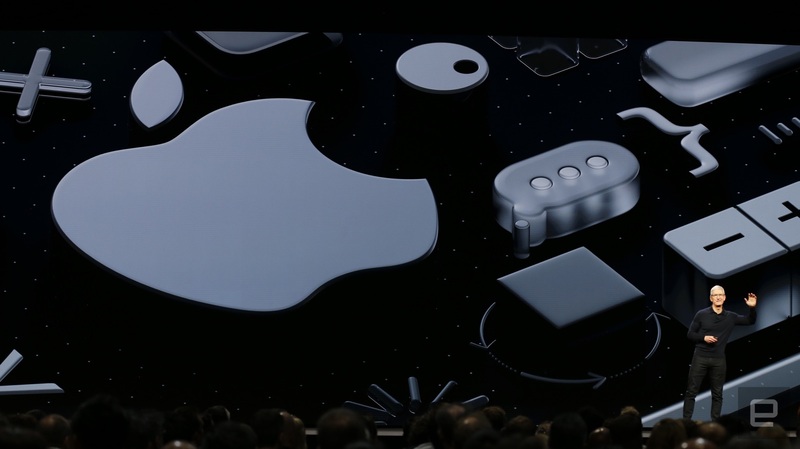 Apple may not have talked hardware at all during its WWDC 2018 keynote -- but that didn't stop the presentation from running for well over two hours. 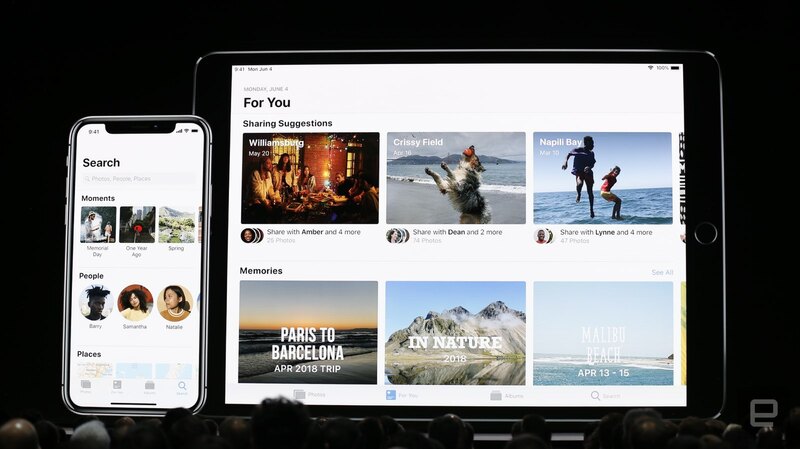 All four of Apple's platforms (iOS, watchOS, tvOS and macOS) will receive major updates this fall, and the company spent plenty of time detailing features large and small that'll change how you use your Apple devices. In a presentation that long, it's easy to lose focus on what's significant. Fortunately, we're here for you. Grab a cup of your favorite caffeinated beverage, sit back and read on for the most important announcements Apple made at WWDC 2018.
iOS 12 will be faster, more personal and hopefully less addictive. "Digital health" has been a big buzzword lately, with good reason: We're all hopelessly addicted to our phones. A month after Google said it would make it easier to keep track of how much time you waste on Instagram, Apple announced similar plans. 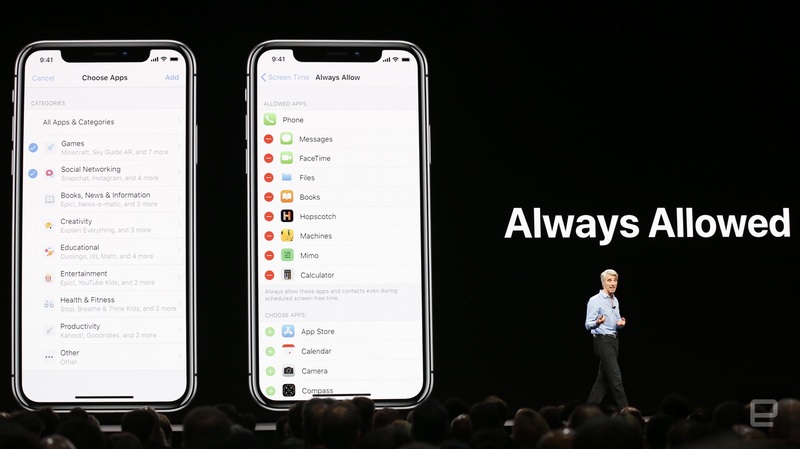 Grouped notifications will hopefully be less distracting, parents can limit their kids' screen time, usage reports will show how you're wasting your time, and you can set limits for those apps so you get notifications when it's time to log off Facebook already. It's no secret that installing big software updates can slow down older phones. Hopefully, that won't be the case this year: Apple says iOS 12 will significantly speed up older phones. Including devices released all the way back in 2013. For example, Apple says that the camera on the iPhone 6 Plus (released in 2014) will open as much as 70 percent faster from the lock screen. Apps launch up to 40 percent faster, while the keyboard appears up to 50 percent faster. And while older phones will benefit from this, newer devices should also feel snappier. iPhone X owners will really get a kick out of the new Memoji. As the name suggests, you can create a personalized Animoji that looks just like you (or not, up to you). It'll keep up your head movements and facial expressions, just like any other Animoji. There's even tongue tracking -- really. FaceTime is getting its biggest upgrade in years: It will support group calls with up to 32 participants. The video-calling service is also integrated into the Messages app. From a group chat, one tap can launch a FaceTime with all participants. Naturally, group calling will also work in the FaceTime app for macOS. The much-maligned digital assistant Siri is getting a pretty major upgrade in iOS 12. Siri Shortcuts are a way to build custom workflows that incorporate multiple apps, letting you carry out multiple actions with a short command. For example, you can set a "driving home" action that'll text your partner, pull up directions, adjust your thermostat at home and play your favorite podcast. These shortcuts work with both first- and third-party apps. 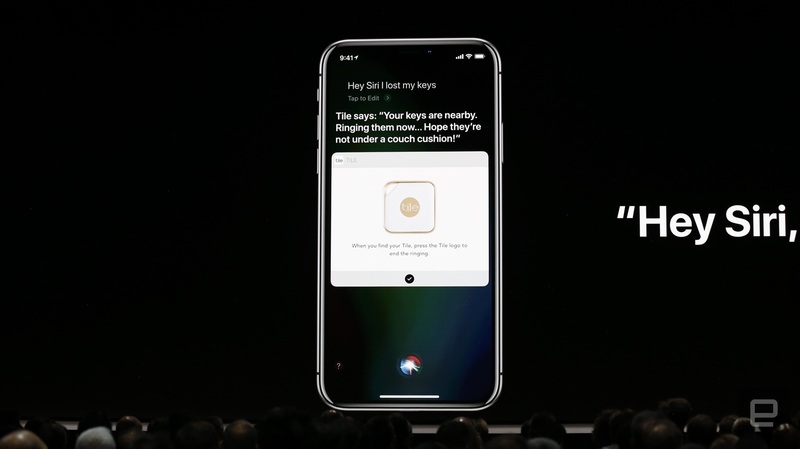 While you'll have to build these shortcuts, Siri is also continuing to learn from your behavior and will start suggesting actions for you. If, for example, you always launch a particular workout tracker at the gym, Siri will ask if you want to open it up when it knows you're there. Or if you order the same coffee every day, it can pop open the Starbucks app automatically for you. Apple is also making Siri more accessible from the Apple Watch. In watchOS 5, you no longer have to say "Hey, Siri" before you start speaking. Just raise your wrist (so the screen turns on) and start talking. Hopefully, Siri will respond with what you actually wanted it to do. Apple's Photos app on iOS gets the job done, but is undeniably basic. That might change with iOS 12, however. A smarter Photos app will include many of the same features Google touts in its incredibly popular Photos service. Search has been upgraded -- you can find pictures based on things like business names or general terms like "museum." All of your photos are also indexed by time and place, so you can search specifically by those metrics, and you can search on multiple terms (like pictures from a particular beach in Hawaii during a specific month). A new "for you" tab holds the auto-created albums that Photos has made for a few years alongside any shared albums. And sharing is getting a major upgrade. Now the Photos app will proactively suggest pictures to share based on who is in them. Probably the biggest change coming in ARKit 2.0 is support for shared environments. This means that multiple people can interact with the same virtual objects, something that can open up a host of new experiences. 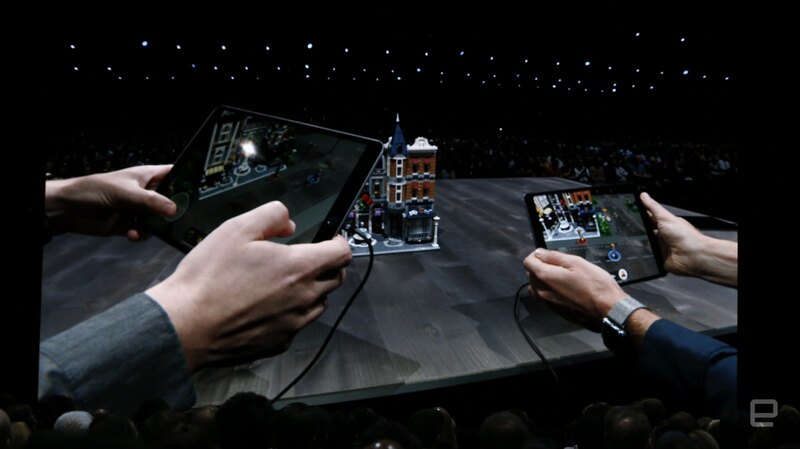 Apple showed off a wild demo that converted a real-life Lego kit into a wild virtual environment that multiple people could play with. ARKit 2.0 also supports object permanence. That'll let virtual objects occupy the same place in a physical location as long as you run the app they're tied to. Developers, meanwhile, should be excited about a new AR file format that Apple created with Pixar. USDZ (or universal science description) will work with Adobe's Creative Cloud apps and make it easier to include AR objects in more places. Apple's demo showed an AR object embedded in a standard Apple News article. While another showed a life-size rendering of a custom guitar built on Fender's website. And all of this happened in the browser, not a specific AR app. 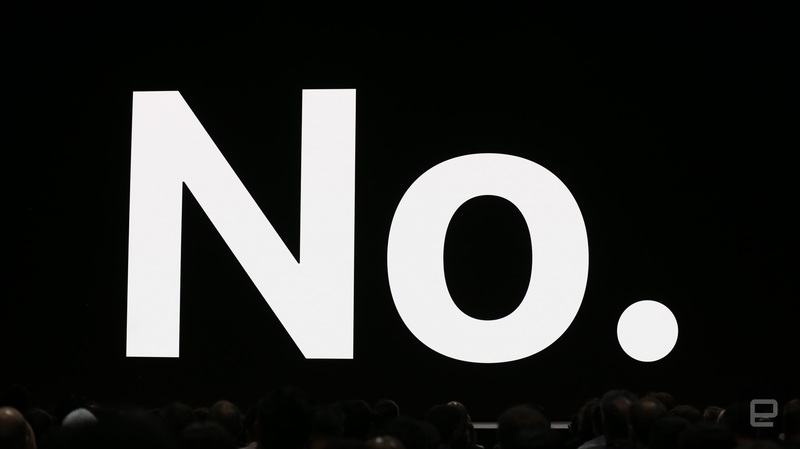 Unofficial Apple Dad Craig Federighi got a lot of laughs when he answered a question he says he's gotten over and over: "Will macOS and iOS merge?" The answer was a resounding "No!" However, that doesn't mean the company won't continue to tie the two operating systems closer and closer. The latest evidence of that are new tools that'll make it much easier for developers to port iOS apps to the Mac. In fact, Apple used them to bring Apple News, Stocks, Voice Memos and Home from iOS to the Mac. Sadly, developers won't get access to these tools until sometime in 2019 -- in fact, it wouldn't surprise us if they weren't widely available until after next year's WWDC. While developers loved the announcement of new tools for porting apps from iOS to the Mac, that was hardly the only bit of macOS we heard today. The upcoming version, named Mojave, includes a ton of user-facing improvements. A systemwide "dark mode" should ease eyestrain and really make certain projects pop. Apple showed off photo apps and coding apps alike, and everything seemed to have a little more oomph against the darker background. It seems the company didn't leave any aspect of the Mac UI untouched. There's even a new desktop wallpaper that cycles through from daytime to nighttime as the day moves on. The Mac App Store is getting a big redesign. And it bears more than a passing resemblance to last year's iOS App Store update. There are big feature "stories" that give a lot more details behind specific apps, and new high-level categories focused on specific activities like create, work, play and develop. Apple browser Safari is getting a few privacy-focused improvements. Probably the most notable is that it can hide the notorious "like and share" buttons that have basically covered the web. Apple says those tools are a big part of how websites track you, so it's just going to block them. Additionally, Facebook-powered comments can also be blocked by default and enabled if you click them. 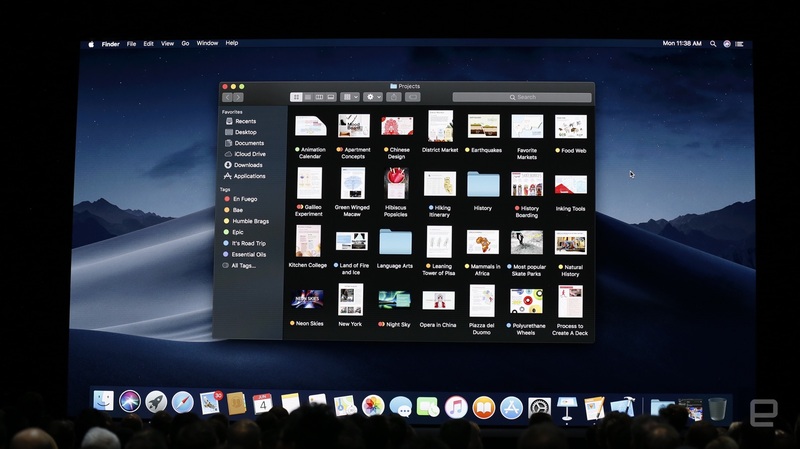 Finally, your Mac's desktop and Finder have new tools to keep you organized. The desktop now has a "stacks" feature that groups files by type; clicking a stack will expand and show all the files it contains. Meanwhile, a "gallery" file browser in Finder shows large previews of documents with a thin strip at the bottom for navigation. It can even display full-file metadata right in the window -- a tool that photographers will surely find useful. WatchOS 5 isn't a radical revision of Apple's wearable, but it's still a substantial update. When the Apple Watch launched, it came with a variety of weird communication apps (like "digital touch") that didn't really take off. However, a new WalkieTalkie feature seems a lot more useful and a lot more fun. Once you give permission to a contact, the two of you can voice chat just by tapping a "talk" button and speaking into your watch. The receiver is alerted by a vibration and audio alert, and the message comes right in. Another big but obvious update came in the way of a Podcasts app for the Apple Watch. Streaming music phone-free with the Apple Watch is a great experience, and Podcasts should offer the same thing. Whatever you listen to will sync to the Podcasts app on your other devices, and you can ask Siri to play whatever you want to hear if it's not available on your Watch. 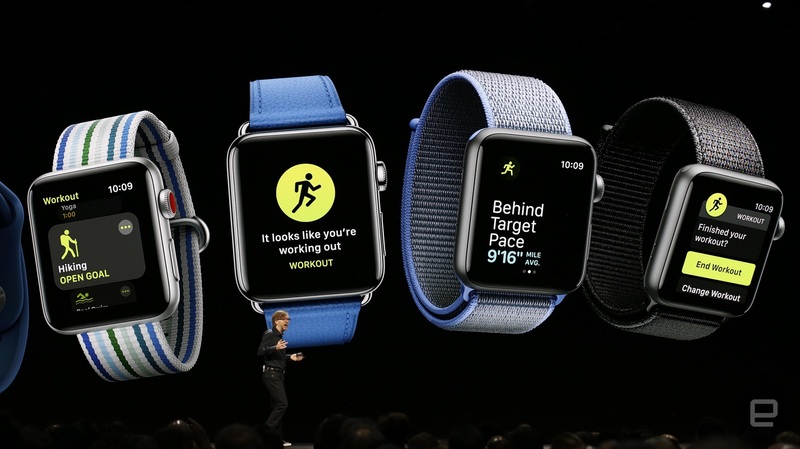 Fitness remains a crucial part of the Apple Watch experience, and watchOS 5 is adding a very handy feature: It will soon be able to recognize when you've started a workout, even if you forgot to track the activity yourself. And it'll also be able to tell when you've finished and ended the workout, if you're really forgetful. Users can also challenge their friends to weekly contests to see who can close their rings the most. Apple had less to say about tvOS, but the two new things it showed off were a pretty big deal. The set-top box will soon support Dolby Atmos audio, which true home theater buffs will certainly appreciate. There's also a "zero sign-in" feature that sounds pretty wild as well. It sounds like the Apple TV can detect your service provider based on the network it is connected to, and it'll then sign in to all TV apps that you have access to without you needing to do anything. For starters, it's only available on Charter (a cable company that also announced a new Apple TV app today), but hopefully, it'll come quickly to other providers. 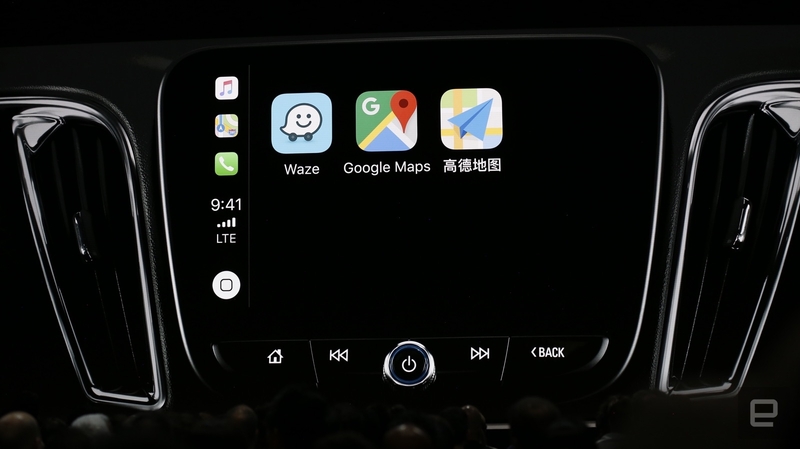 CarPlay was barely mentioned, but Apple did add support for two hugely important apps: Waze and Google Maps. Yes, if you still don't trust Apple Maps, you can retreat to the safety of Google's services, built specifically for the CarPlay interface. As always, these updates won't be available until the fall, so most of us will need to be patient. To whet your appetite, just stay tuned to our WWDC coverage as we dig deeper into everything new that Apple showed off this morning.